Flymo 1200R Review: Is the Flymo Robotic Lawn Mower Any Good? Lawn aeration is a procedure that needs doing to keep your lawn healthy. Especially if you have kids and pets that like to run around on it. 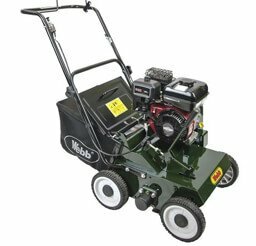 In this guide, I’m going to explain everything you need to know about lawn aeration. What it is and why you should do it, what time of year is best and how to do it properly. The end result is that your lawn can breathe and take in nutrients it needs to look spectacular. If you want the best results possible when you aerate your lawn, I encourage you to read this guide fully. It’ll take you around a quarter of an hour. Bookmark this page so you can come back to it if needed and even print it out if you have to. What is Lawn Aeration and Why Do I Need to Do it? Lawn aeration is the process of relieving soil compaction and creating space in the soil. This allows water, oxygen and nutrients to penetrate. ‘Coring’ the lawn with a hollow tine aerator to remove small cores of turf. The method you choose will depend on the type of soil in your lawn. Aerating improves bacterial activity and aids the decomposition of dead organic material, reducing the amount of lawn thatch. In turn, this improves the health and look of your lawn. Soil compaction occurs when soil particles get pressed together, squeezing out the air and water between them. In a typical family garden, this happens when kids spend their days playing on the lawn. The forces they put through the soil when they run and tumble on the grass causes the soil underneath to compress. 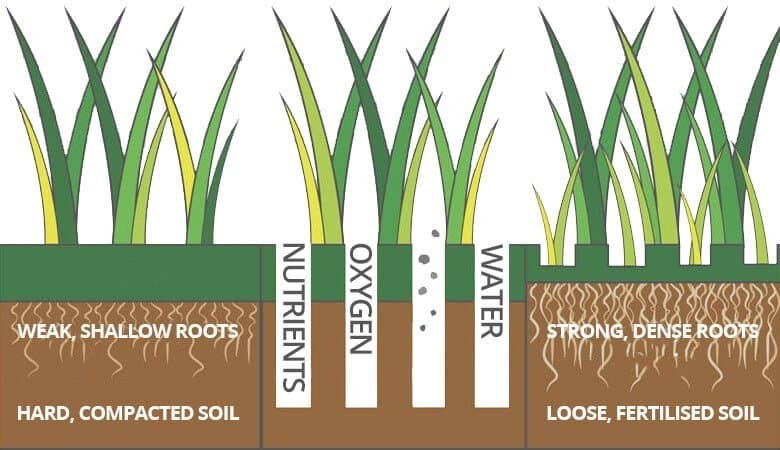 Over time, soil can become so compacted that virtually no oxygen, water or nutrients are able to penetrate the soil. If not dealt with, this can lead to an increase in lawn thatch, moss infestations, weeds that thrive in compacted soil, or disease. But through aeration, the lawn will recover and look fantastic fairly quickly. A poorly aerated or compacted lawn can show a variety of symptoms. However, these symptoms aren’t exclusive to compaction and are also caused by other things. That said, a compacted lawn is an unhealthy lawn, which can cause other problems. Aeration will improve the health of your lawn which in turn relieves them. A compacted lawn or compacted areas of your lawn can have an old, distressed look to them, especially in the summer when conditions like Dry Patch can be common. Because there is no moisture in the soil, the grass suffers and dries out, causing this distressed look. This is more of a problem with heavy clay soils. If the soil is badly compacted, water can’t penetrate and has nowhere to go, so, it just sits there. The lack of water or standing water can result in your lawn becoming diseased. Fusarium in Autumn and Winter, Red Thread in the Summer and Rust in the Autumn can all develop in poorly aerated lawns. Grass struggles to grow in compacted soil and where grass struggles to grow, moss usually takes over. If your lawn is predominantly made of moss, chances are compacted soil is contributing to the problem. It’s not just moss that likes to grow on compacted soil. There are certain weeds that thrive in it. Black Medick and Plantain Weeds are weeds that love compacted soil. Daisies, Dandelions, Self Heal and other weeds grow well in it too because compacted soil is typically deficient in nutrients. The sight of mushrooms in your lawn is more often than not, a good thing. That said, Mushrooms can often grow in lawns where compacted soil is an issue. This is a result of water laying on the surface. Fairy rings which are a fungal infection in which toadstools grow in a circle can also be a sign of compaction. The hardest symptom to spot but worms are your lawns natural aerators, as are other insects like Miner Bees. It’s possible for your lawn to become so compacted that worms simply can’t live there. Check your lawn for worm casts, if there are none, chances it’s because the soil is too compacted. Spiking a lawn involves pushing spikes into your lawn using various tools. These holes are a few millimetres wide and a couple of inches deep. They allow oxygen, water and nutrients into the soil which keeps it healthy. This treatment should be part of your regular lawn maintenance program. 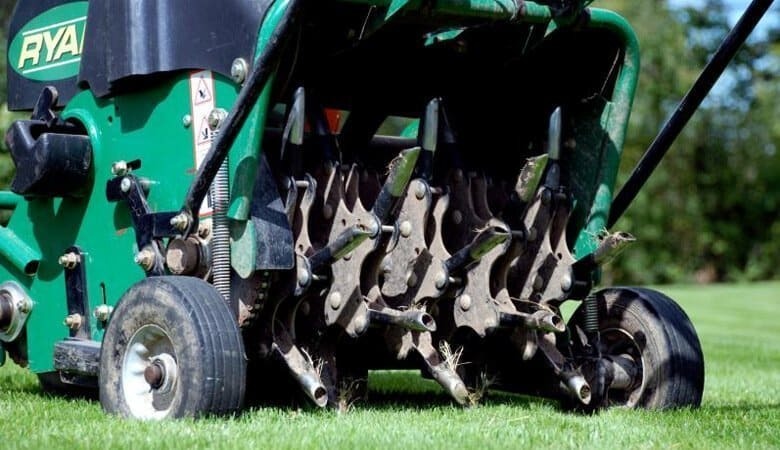 Hollow tining is a process of pushing hollow tines into the ground to remove cores of turf from the lawn. These cores are generally around a centimetre wide and a couple of inches deep. After a couple of weeks, you’ll notice the holes disappear. This is because the rest of the lawn to relaxes into them, reducing compaction. 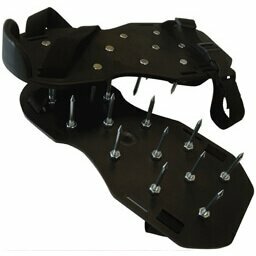 These strap onto your footwear and spike/aerate the lawn as you walk across it. They take a bit of getting used to as you’ll need to pick your feet up properly instead of dragging them but you’ll soon get comfortable with it. If you wear them while cutting the grass you’ll get through two jobs in the time it takes to do one. You can use these regularly on all kinds of soil. If you have a larger lawn you might consider investing in a rolling lawn spiker. This is essentially a drum that has spikes sticking out of it that you push up and down the lawn. Because all you have to do is push it around, you can spike quite a large lawn fairly quickly. Again, you can use these on all lawns. If your lawn is suffering from compaction issues, a hollow tiner will relieve this compaction by removing cores from the lawn. It’ll also improve drainage when coming into the Autumn. They’re especially useful on clay-based soils that don’t crumble but can also be used on compacted, sandy soils. That said, spikes are better for regular aeration of sandy soils. These are good if you have hundreds of square meters of lawn. Doing it manually with a fork is hard work and takes a lot of time, even on smaller lawns. 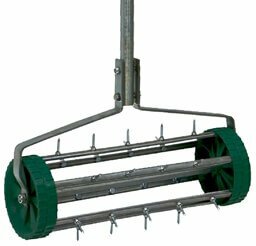 A powered aerator is the only option if you have a large lawn. They often come with two drums, one that has spikes and the other with hollow tines for removing cores. The downside is that they’re expensive to buy but you can hire them relatively cheaply. Lawn aeration is a simple treatment but it’s still important to do it at the right time of year. Doing so will prevent you from creating more problems than you’re trying to solve. Spiking your lawn can be done as part of your lawn care jobs in spring and Autumn. If the soil is really soft don’t bother. Also, avoid spiking if the weather is dry and hot as this can dry the soil out. Timing it so you finish aerating just before the rain comes that would be perfect. If there’s no rain forecast you could help the lawn by turning on your sprinkler system (if you have one and there are no water bans in your area). Like lawn scarification, hollow tining is a pretty invasive treatment. This means you should only do it when weather conditions allow for good recovery. Therefore Autumn is the best time you should hollow tine your lawn. The only other acceptable time is in the spring IF if wasn’t done in the autumn. If you do it in the Spring, you open to ground up to weed seeds and could end up with an infestation of weeds. Do it in the summer and you’ll dry the lawn out and potentially kill the grass. Aerating your lawn is best done on a damp (not soaking wet!!!) morning. This is because the ground will be softer and therefore make the job easier. Trying to aerate dry, hard ground isn’t fun so don’t even try! Before you aerate your lawn it’s a good idea to cut the grass quite short. 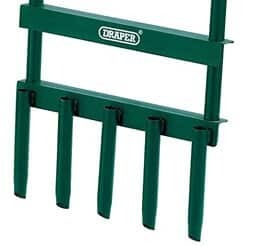 This will make the process of aerating easier. If you’re hollow tining and you have a rotary lawn mower, you can also use it without the grass collection box to chop up and re-distribute the cores back over the lawn once they have dried out. You can’t do the job without one! 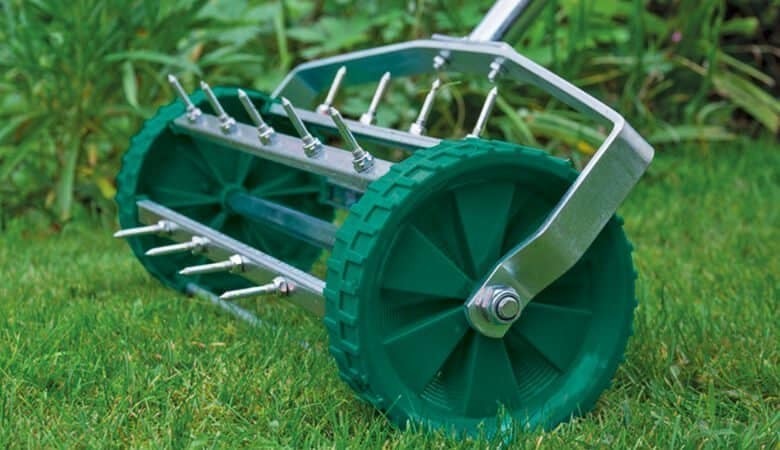 If all you need to do is spike your lawn a pair of spiky aerator sandals or a rolling aerator will do. If you’re hollow tining, you’ll need a manual hollow tine aerator or even a powered one if you have a lot of lawn to treat. It’s always a good idea to overseed your lawn after an invasive treatment like aeration. The germination and growth of new grass seed will help the lawn recover as quickly as possible. As I have already mentioned, hollow tining is a fairly invasive treatment. If the soil has is compact, chances are, there won’t be many nutrients in it. As such, you’ll want to give it the best chance of recovery by putting down some lawn fertiliser. Depending on when you aerate your lawn it’s a good idea to water it afterwards. This will put water right into the soil giving the grass some much-needed moisture. It’ll also help break down the fertiliser if you’ve hollow tined. If you can time it so the rain comes just after you’ve finished, that would be perfect. But the chances of that working out are often slim. So it’s a good idea to water the lawn when you’ve finished. The good news is that lawn aeration is a very simple process. That’s said, if you’re hollow tining manually, it’s hard work! Before you start aerating your lawn it’s a good idea to cut the grass quite close. This makes it easier to see what you’re doing and makes hollow tining much easier. That said, it’s not a good idea to just scalp your lawn in one cut as it will shock the grass. Grass is 85% water. If you just hack it down by half, you take 50% of its water. This can make the grass weak, even kill it. Especially when it’s hot. The whole point of aeration is to improve your lawn, so take the height of the grass down gradually. Start by just taking the top of the grass and then reduce the mowing height by one setting every 3 or 4 days until the grass is around 5cm high. When it comes to spiking your lawn, you really can’t overdo it, so, take your spikes and just get stuck in. I personally do 4 passes with the spiker over my lawn. On your first pass, start in the corner and spike along the long edge of your lawn. Then, take a step into the lawn, turn around and come back the other way, in exactly the same way as you’d mow the lawn. It doesn’t matter if you’re wearing aeration sandals or you have a roller, the process is exactly the same. Go up and down the until you have spiked the whole lawn. Then do a second pass at a 45-degree angle so you travel diagonally across the lawn. Do your third pass 45-degrees to your second pass so instead of going along the length of the lawn you cross the with of it. Your fourth pass will be 45-degrees to your third so you go back across the lawn diagonally, opposite to the second pass. Start in the corner of the lawn and push the hollow tines into the turf. You might need to get some weight behind it and use your feet to get it into the grass. Pull it back out, place the hollow tine fork 3-4 inches in front of the holes you just made and repeat the process. 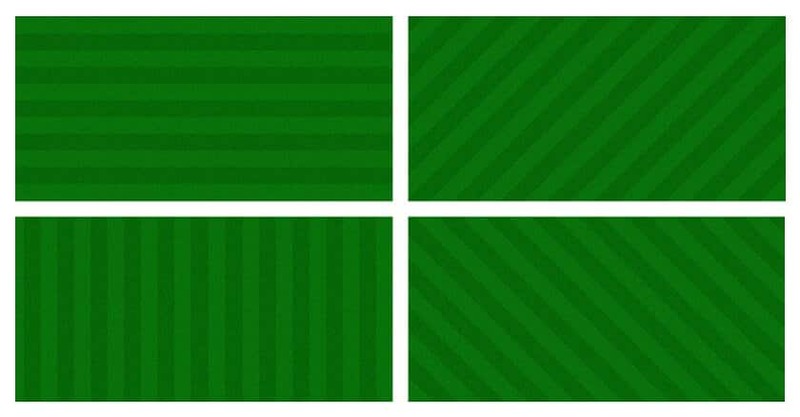 Simply follow your regular mowing pattern until the whole lawn has been aerated. Be prepared, hollow tining with a manual tool is hard work and it can take a quite while to hollow-tine even a small lawn. It’ll keep you fit thought! NOTE: Hollow tine forks work best on lawns with light, sandy soil. Clay soil can block the hollow tines and you’ll spend all your time unblocking them. Different petrol hollow tine aerators have different instructions so check when you buy or hire one but the process is the same as using a fork. Give your lawn one pass with your machine, following your normal mowing pattern. If your lawn is badly compacted, give it a second pass at a 45-degree angle to your first pass so you go across the lawn diagonally. When you’ve done hollow tining your lawn it will be covered in cores of turf. It keeps those nutrients in the lawn. It stimulates bacterial activity which causes thatch decomposition. 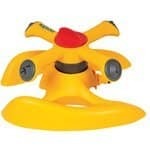 If you don’t have a rotary mower and you’re unable to do what I’ve just described above, you’ll want to remove them. Just leaving the cores there will cause your lawn to go bumpy and can even cause disease. You can smash them up and spread the soil back over your lawn (in the same way a rotary lawn mower does). Or you can break them up and toss them into the borders or added to the compost heap. If you have aerated your lawn with spikes you can simply turn on the sprinklers and give the lawn a dampening. This will get water into the root zone of the grass and promote growth. Nitrogen – makes grass grow and become greener. Phosphorus – stimulates root growth and seed development. Potassium – strengthens grass against disease and drought. By applying a lawn fertiliser you’ll put these nutrients back into the soil which will help the grass grow and spread. It’s also a good idea to re-seed your lawn with new grass seed as this will help to create, a thicker, lusher lawn more quickly. After hollow-tining your lawn it might also be worth top dressing it. 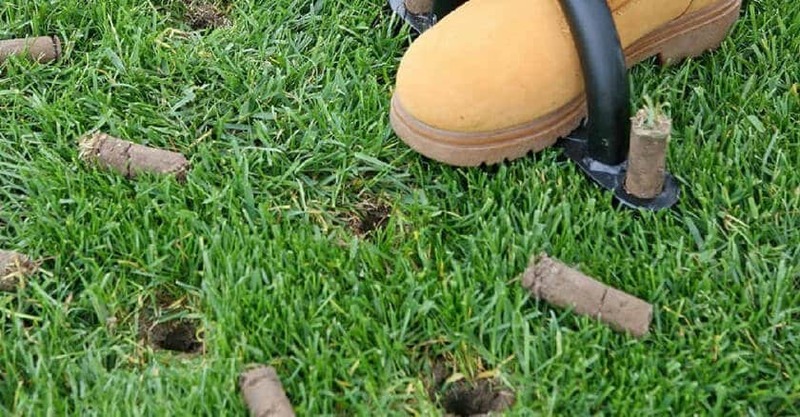 This involves spreading a topsoil over the surface of your lawn and working it into the holes created by hollow-tining. This helps to improve the soil structure and the retention of nutrients and moisture. It also provides a perfect bed on which to spread new grass seed. Lawn aeration is a very simple procedure but your lawn will benefit enormously from it. It’s definitely not something you need to get a lawn care company to do if you don’t want to. Just be prepared for some hard work if you plan to use a hollow tining fork! But your lawn with thank you for it! I’d love to see your before and after pictures and if you have any questions or comments, please let me know in the comments. Some of the pages on this website contain affiliate links. That means if you click on a link and buy a product from another website, I may get paid a small commission. It doesn’t cost you any more to buy a product but these commissions contribute to the costs of running this website. For more information about how this site is funded, Click Here. GardenSeeker.com is a participant in the Amazon EU Associates Programme, an affiliate advertising programme designed to provide a means for sites to earn advertising fees by advertising and linking to Amazon.co.uk. Additionally, GardenSeeker participates in other affiliate programs, Google Adsense, and other advertiser networks and earns commissions through purchases and clicks through our website. © GardenSeeker.com. All Rights Reserved.